September 2, 2013 Update: Our International Facebook Page has a fan base of over 1,000. Back on April 7, 2013, when we only had a fan base of just over 500, one of our posts was SHARED by over 4,000 Facebook users and the 'Insights' Facebook provides to its owners indicated that it had the potential of being seen by over 400,000 Facebook users. In part, this is why we have integrated 'iframe' windows to our state-specific Facebook pages on our website pages for all 50 states, including Washington (SEE BELOW). 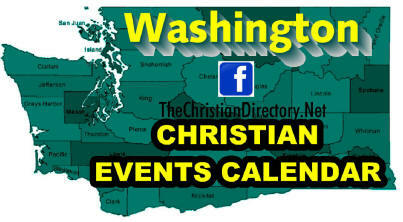 If you have a Christian event you would like to submit for approval, please go here to ADD A CHRISTIAN EVENT LISTING now. The state-specific Events Calendar (seen below) in combination with a searchable events listing is $10 each and state-specific side banner advertisements are $10 each. CONTACT US if you are interested in any of these paid-advertising options. *Promotional credits earned through our REFERRAL BOOSTER PROGRAM may be applied to the cost of the Events Calendar listings and/or side banner advertisements - however, they may not be used in combination with other promotions, unless otherwise stated or agreed upon. Contact Us to learn how to be added. Churches, Ministries, and Missions who wish to be identified in their communities. picnics, radio shows, revival gatherings, speakers, TV shows, etc. "Comment" section when addiing your business/event listing, or by submitting our "Contact" form to us. Be Found Website Services, Inc.